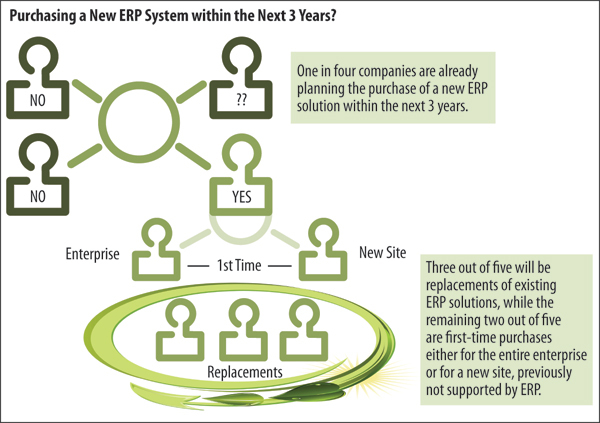 » home » magazine » 2012 » september 2012 » is it time to purchase a new erp system? Is It Time to Purchase a New ERP System? Cindy Jutras is principal, Mint Jutras, LLC, Windham, NH, an independent research-based consulting firm that specializes in analyzing the business impact of enterprise applications; cindy@mintjutras.com; www.mintjutras.com. Whether you are contemplating a first-time purchase for your entire company, expanding into a new territory currently not supported by enterprise-resource planning (ERP), or deciding whether to replace your existing ERP solution, it’s a big decision. For decades ERP replacement has been compared to brain surgery—you don’t do it unless the patient is dying. Today, the better analogy is joint replacement—you suffer with that bum knee or hip until you no longer can stand the pain. Apply these same principles to your next (or first) ERP purchase. Suffer along if the status quo is “good enough.” But what if it’s not? Sure there will be some recovery time required; plan for it. But with careful selection and planning, and aggressive goal setting, you can be operating pain-free and better than ever by implementing a new ERP system. According to data collected for the Mint Jutras 2011 ERP Solution Study, 62 percent of businesses with an ERP system installed are running the first solution ever implemented in the company. That means 38 percent have bitten the bullet and replaced their ERP solution. This does not necessarily mean a change in solution provider; a replacement could mean a newer or different product from the same vendor, or it could mean opening the door for a competitive bid. Of those that have replaced their ERP system, 65 percent also replaced their vendor. While the brain-surgery analogy is catchy and dramatic, the better analogy is joint replacement. Look to replace your ERP system when the pain of using outdated technology, hard-to-use software and missing features and functions becomes too great. Or, when your current solution simply cannot support your business needs. There is of course a certain level of subjectivity in this type of decision, based partly on your company’s tolerance for pain. If you want to climb mountains or ski down them, you will be more inclined to replace that knee. But if all you want to do is sit on the couch and watch television, maybe not. Likewise, if you have no plans to grow your company and improve its performance, then your current ERP solution may be just fine, even if it doesn’t perform well or produce worldclass business results. But do not let your current ERP system, or lack thereof, become an excuse for poor performance or stagnation. Why Do Companies Replace ERP? • The inability to scale with growth of the business. Yet, when we asked a similar question of all respondents, asking what might prompt a replacement in the future, the responses were more evenly spread across a variety of factors (Fig. 1). Functionality (51 percent) and outdated technology (44 percent) still claimed the top two spots, but the inability to support growth plunged to the bottom (16 percent). Taking its place in third place (38 percent) was the perception that there was a cost advantage in replacing ERP software. Some of the cost savings are obvious, some more subtle. Clearly the implementation of newer technology and more functionality should result in productivity gains. Replacement of outdated technology also can save in terms of maintenance—preventive and remedial. Heavily customized solutions may prevent companies from moving forward. But if you truly require heavy customization, then it may be time to reevaluate whether you have the right solution for the job at hand. Perhaps you made the best decision at the time of the purchase, but newer technology and rapid application-development models have allowed ERP-solution providers to add features and functions at a far more rapid pace than in days gone by. Perhaps you now are able to purchase that same functionality off-the-shelf, thereby eliminating the recurring costs of maintaining customizations, while allowing you to take better advantage of innovation you already are paying for with your maintenance dollars. In fact, your current solution provider may already have incorporated features into its standard software that you developed as custom. If customizations have you stuck in older releases, perhaps re-implementing the same software at the most current release provides more opportunity, at a lower cost than an upgrade. What About First Time Purchases? 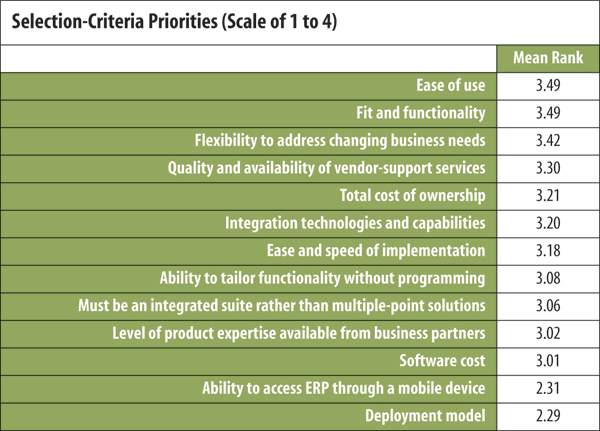 We asked survey respondents if they planned to purchase ERP software within the next 3 years. One-fourth said “yes” (Fig. 2), and 51 percent said “no,” with the remainder unsure. 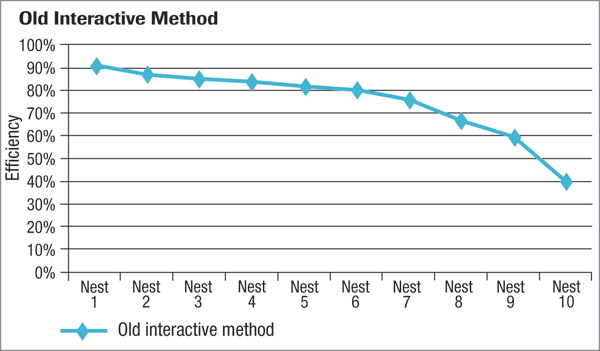 Of those planning a new purchase in the next three years, 60 percent will be replacing their current system. This indicates that either the patients are dying, or decision-makers have begun to understand the benefits of not waiting for a terminal diagnosis. Twenty percent of the new purchases represent first-time ERP investments by companies, many of which are small companies. Of these firms, 34 percent run their companies on desktop applications and another 16 percent still use some combination of manual processes and spreadsheets. Yet almost half (47 percent) do have some enterprise applications—accounting, for example, or applications that they describe as “legacy” applications. • You lack control. Processes are manual; data is scattered in file cabinets, offline spreadsheets and across desktops. Data transfers repeatedly between desks, adding little value and introducing the risk of errors. • You want to grow but you are running blind, not able to understand where the real profit centers are within the company. Established products, or new products? Domestic sales or sales in emerging markets? • You can’t meet customer demand. Inventory levels are rising, yet you’re missing ship dates. How can you better forecast demand, lean out your inventory, and produce just-in-time? • Cash is tight, so decisions must be made. Should you finance your supply-chain costs and invest in growth? Credit is tight—can you prove credit-worthiness to investors or creditors? Perhaps you are one of the undecided. Or, perhaps you have decided you need a new ERP system but still must convince the CEO or board of directors to take the plunge. How do you justify the investment? Projecting a return on your investment (ROI) is a good place to start, but often is overlooked when the patient has begun to die. Why bother to project cost savings or other improvements when the company’s survival should be enough to justify the purchase? The answer is simple: By establishing a baseline of metrics, setting goals and measuring results, you derive more value. Notice that the title of Fig. 3 refers to savings experienced since implementing ERP, not as a result of ERP. While ERP is perhaps the catalyst and provides a timeline, success results from the combined effort of people, processes and technology. Fig. 4 includes other improvements that may either directly or indirectly impact top- or bottom-line performance. And while the cost savings and improvements of worldclass ERP implementations often are more than double those of all others, it is important to note that even the average cost savings can easily cost-justify the initial expense. There is no set timeline for achieving these results. None of our survey respondents admitted to not projecting a timeline for recouping their investment in ERP. Yet, only 70 percent answered the question, leaving little room for doubt that many actually do not. Typically we would encourage companies justifying their ERP purchase to be aggressive in achieving ROI, but it would appear that recouping the cost within a year is unrealistic (Fig. 5). This is not surprising given the average time to achieve the first “go live” milestone was 8.2 months (6.9 months for worldclass). However, we should point out that results can be seen even before going live, particularly if a company is disciplined in evaluating current processes before automating them. ERP often can be used as a catalyst for process and organizational change that is conducive to improvement. Once a company has completed the exercise of cost-justifying its ERP-system investment and is ready to make the purchase, it then must carefully evaluate the software solutions available to ensure it acquires the right solution to meet its requirements. Volumes have been written on this subject and there is no shortage of independent consultants that can help with the process. Make a list of the criteria that are most important, and evaluate several ERP solutions based on those criteria. Fig. 6 provides a list of the most common selection criteria. Survey respondents prioritized each criterion on a scale of 0 (“not a consideration”) to 4 (“must have/most important”). 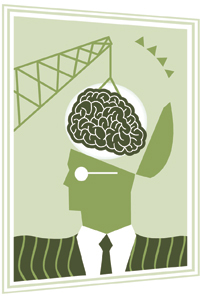 You should do the same: Prioritize each criterion, and add any others you deem important. Since we’ve been surveying manufacturers regarding ERP investments, fit and functionality als have been the top priorities when selecting a new system. Until now, that is. “Ease of use” has become just as critical, as ERP users have become accustomed to intuitive interfaces and easy-to-use smartphone apps. “If it’s not easy to use, our employees may not embrace the solution,” is what we hear. It not only is important that the solution fit a company’s current needs, but future needs as well. In fact, survey respondents report that managing change is their main obstacle to achieving expected results from their ERP solution. Companies must plan for change, and carefully evaluate any ERP solution’s ability to adapt to changing needs. Worth noting here are the two criteria on the bottom of the list—mobile access and deployment options. Mobility seems to be all the rage these days. While mobile devices free us from wired connections, they actually seem to tether us more firmly to our businesses. However, do mobile devices really provide improved access to the enterprise data managers use to make decisions and run their businesses? While many use their smartphones to be alerted to a potential problem or situation, once alerted, most turn that smartphone into a dumb phone and call a colleague, rather than directly access enterprise data. Many companies and managers still miss the connection between proactive management and the underlying enterprise data that runs a business. It’s only a matter of time before this changes, and when it does the changes will be dramatic. Those executives who have als been one step removed from directly touching ERP will have their hands all over it. So, if you are contemplating replacing your ERP solution, ensure that mobile access is available. The excitement surrounding software as a service (SaaS) ERP has been escalating for several years. While just a few years ago companies seemed willing to let their other applications (CRM, for example) reside in a SaaS environment, they were less willing to place their systems of record (ERP) in a cloud they did not own or control. In recent years, that’s changed, and many are weighing the pros and cons of SaaS ERP. This can be an important consideration for first-time ERP purchases, particularly if cost was the primary reason for not previously investing. Cost savings, including total cost of ownership, startup costs and cost of IT staff, can be substantial with a SaaS deployment. Even if the subscription cost over time equals the cost of software and maintenance, there are still the savings achieved by eliminating the purchase and continued maintenance of hardware. If you have no IT staff today, there is no need to hire any. And if you do have a good IT staff on board, investing in a SaaS ERP solution allows them to engage in more strategic, value-added activities rather than performing routine maintenance. Do you recognize an opportunity at your company to improve your ERP performance and functionality? Don’t wait until the patient is dying. Making a selection and running an implementation project when the business is under duress does not create an atmosphere of careful consideration, planning and execution. You will be tempted to take shortcuts that you may later regret. Need a new ERP system but can’t afford it? Consider the potential cost savings. Most ERP solutions pay for themselves within 2 to 3 yr. If capital funds are not available to support the project, consider SaaS deployment, with less up-front costs. Also, our survey respondents with SaaS implementations reached their first go-live milestone 19 percent faster than those with on-premise solutions. Cindy Jutras provided a keynote presentation at The Manufacturing ERP Experience, held August 23-24, 2011, in Chicago, IL. She’ll provide another keynote presentation at this year’s Manufacturing ERP Experience, slated for October 3-4, 2012, in Cleveland, OH. Learn more and register to attend at www.metalformingmagazine.com/ERP.